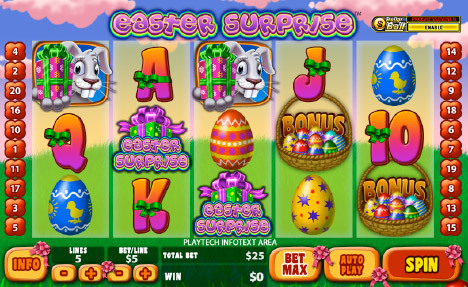 Easter Surprise video slot at Fly Casino is a must play game during the Easter Holiday season! This 5-reel, 20-payline game is filled with chocolate eggs, bunny rabbits and wicker baskets full of Easter Eggs. Of course, as you enjoy the game here at Fly Casino you are hoping to get the three bonus symbols to trigger the Easter Eggs Bonus feature. This feature will grant you eggs to choose an instant cash prize. 10 FREE GAMES AT 3X WINNINGS! The second bonus feature is when you get three Easter Surprise symbols on the reels. This will trigger 10 free games with all winnings X 3! This is where the real surprises can be found in this game. Enjoy Easter Surprise this weekend! Happy Easter! On Sunday from 00:00GMT until 23:59 GMT, all members on their first deposit of just $/£/€30 or more will receive a 110% bonus up to 110.00. $40 Gets $60 X 3 Play Day! From 00:00GMT until 23:59 GMT, all members on their deposit of $/£/€40 or more will receive a $/£/€60.00 bonus. Claim it 3X. $250.00 BIG TUESDAY! From 00:00GMT until 23:59 GMT, all members on their deposit of $/£/€30 or more will receive a 100% bonus up to $250.00 bonus. Super $220 Thursday! From 00:00GMT until 23:59 GMT, all members are invited to receive a 110% bonus up to 220.00 on your first deposit of $/£/€ 30 or more.